"A five-star recipe for sirloin steak cooked in butter, garlic and wine, and then set on fire! Crushed peppercorns, brandy, and a cream sauce give this an extra classy taste." Press crushed peppercorns into both sides of each steak. Sprinkle with lemon pepper and salt. Melt butter in a large skillet over medium-high heat. Stir in garlic and wine, and cook for 1 minute. Arrange steaks in pan, and cook until desired doneness, about 5 minutes per side. Reduce heat to low. Pour brandy onto steaks, and carefully light with a match. Let the flames burn off. 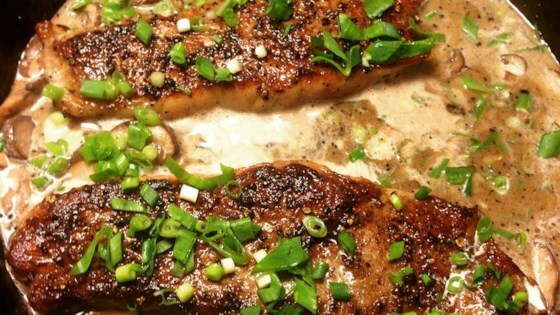 Sprinkle green onion and shallot around the steaks, and circle the steaks with cream. Cook, stirring sauce, until hot. Transfer steaks to plates. Stir sugar into sauce, and then spoon over meat. Be the boss of awesome sauce!